Hi DifferenceMakers – Several Faculty Fellows just returned from the Pathways to Innovation Conference in Las Vegas, Nevada. 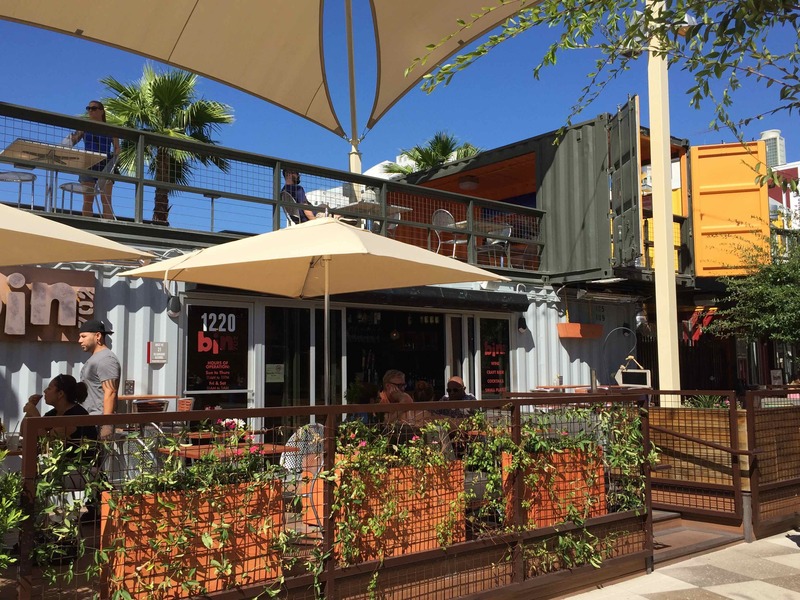 While our hosts from Venture Well made sure to keep us busy in Strategic Doing sessions, we did have a chance to visit an innovative retail center built from used trucking containers – yes, those ugly steel boxes stacked up in seaports and shipped cross-country by truck. But Container Park, located in the downtown Fremont district, really brings new life to the containers and to the district. Entrance to Container Park in Las Vegas, Fremont District. 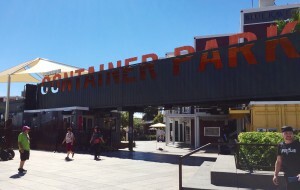 Container Park hosts a number of retail shops, restaurants and cafes, as well as a very fun climbing structure/tower to keep children and parents quite busy. 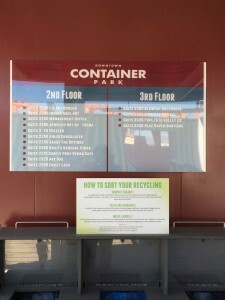 List of shops on the second and third floors of Container Park. 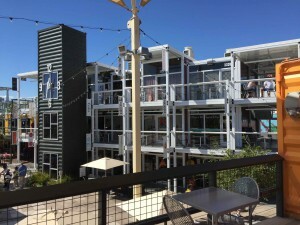 The containers are stacked up to three high and there is an elevator (built in containers of course) and stairways. 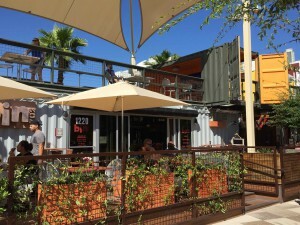 Three stories of container retail are serviced by an elevator (hidden in a clock tower) and stairs. In the center of Container Park is a wheelchair accessible, climbing structure for children and parents. 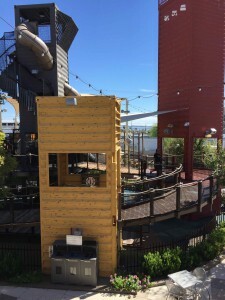 Climbing structure for kids and parents. 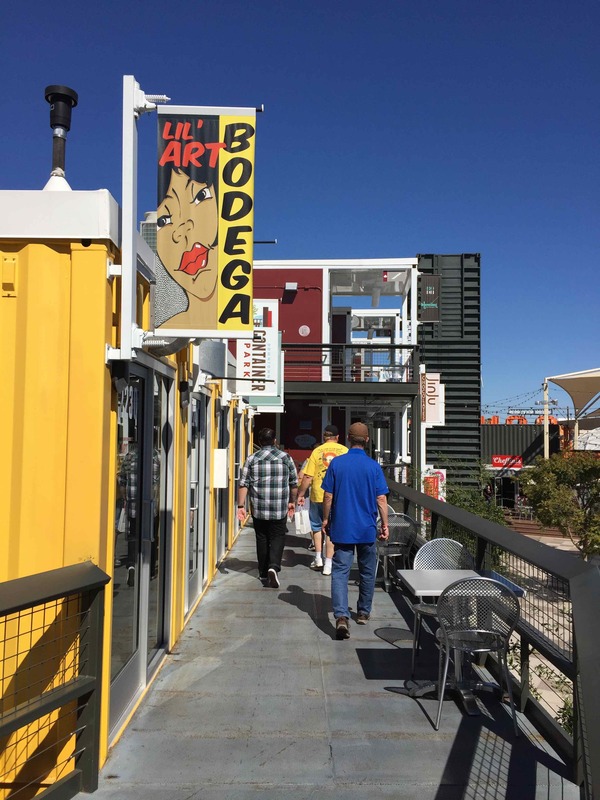 The park is part of the revitalization of the downtown Vegas area, an area that has weathered some challenges as the massive development of the Vegas Strip has drawn tourists and resources ways from the downtown area. When we visited Container Park in the middle of a Saturday, it was quite busy, with tourists and locals shopping and enjoying the day. Last week on Wednesday, September 30th we kicked of the entrepreneurship calendar for the fall 2015 semester! We held our Fall 2015 Kick Off event in the Saab Emerging Technologies and Innovation Center Atrium on North Campus. Roughly 100 people, ranging from students, faculty, staff, and alumni, attended the event which took place from 6:00pm to 8:30pm. 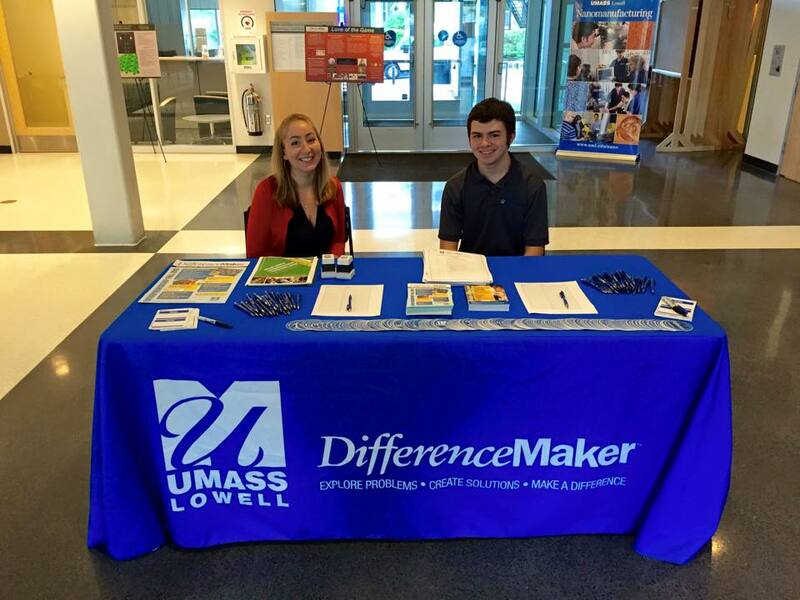 DifferenceMaker Co-op employees, Thalia and Paul, welcoming guests to the Saab ETIC Atrium. Steven Tello, Associate Vice Chancellor of Entrepreneurship & Economic Development and DifferenceMaker Founder, started the event by introducing the program’s mission. Following his introduction were three representatives from each of the three DifferenceMaker College Competitions. Stephen Johnston, Assistant Professor of Plastics Engineering and DifferenceMaker Faculty Fellow, introduced the Francis College of Engineering Prototyping Competition. 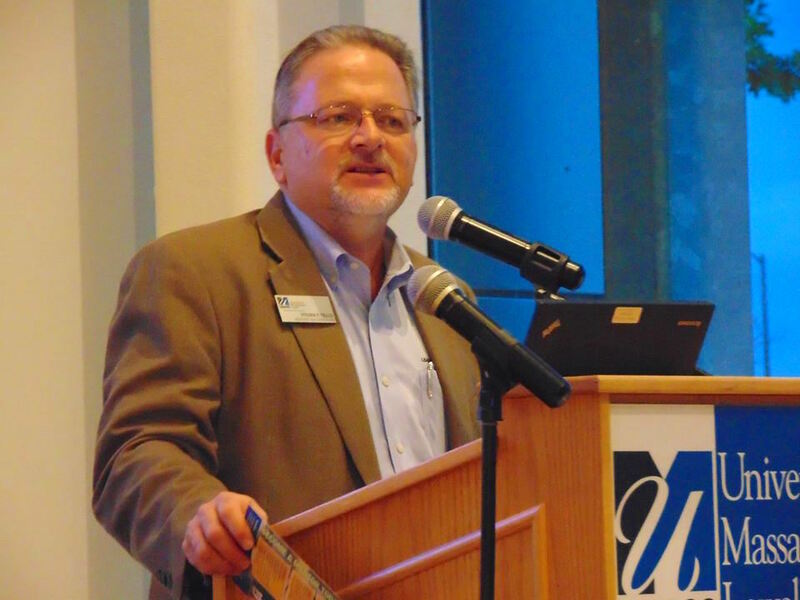 Next, Glenn Morgan, Co-owner of SkyWorld Interactive and member of the UMass Lowell class of 1986, announced the Fine Arts Humanities and Social Sciences’ Creative Venture Competition. Lastly, Scott Latham, Acting Dean and Associate Professor of the Manning School of Business, announced the Digital Federal Credit Union Innovation Contest. Steven Tello, Associate Vice Chancellor of Entrepreneurship & Economic Development and DifferenceMaker Founder, welcoming attendees. Following the College Competitions announcement, Holly Butler, the DifferenceMaker Program Director, led a brainstorming activity where students had the opportunity to brainstorm solutions to big problems surrounding topics such as banking, social responsibility, healthcare, and more. 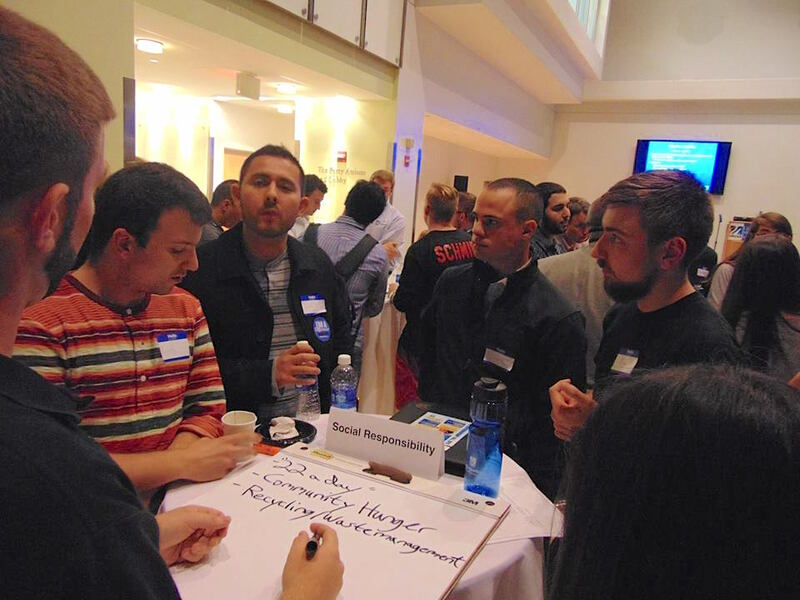 Students had the opportunity to network and meet potential team members and mentors. Student attendees brainstorming about solutions to problems regarding social responsibility. To view photos from the event, click here. 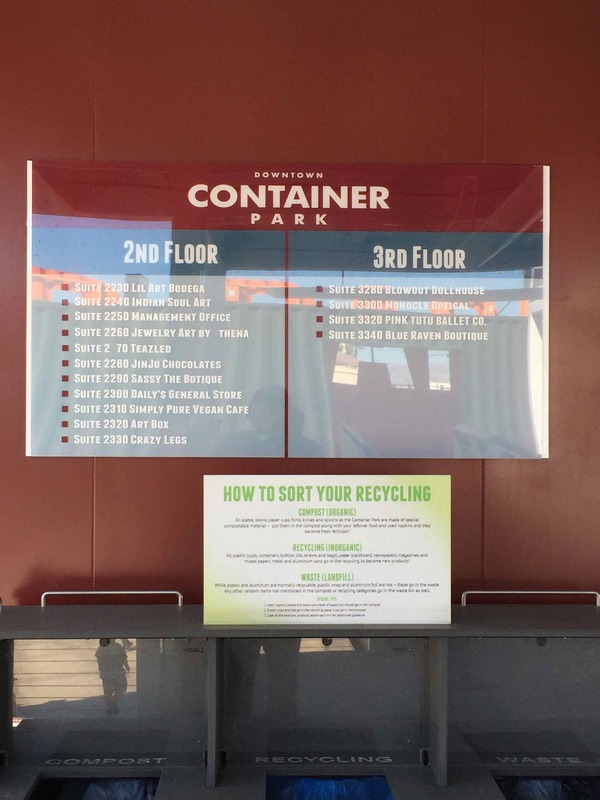 To view a full list of DifferenceMaker events this semester, click here. Thank you to everyone who participated in the Fall 2015 Kick Off event. We look forward to seeing more of you this semester!